Like most people do, we flew to Bucharest and trained to Brașov, the biggest city in Transylvania. 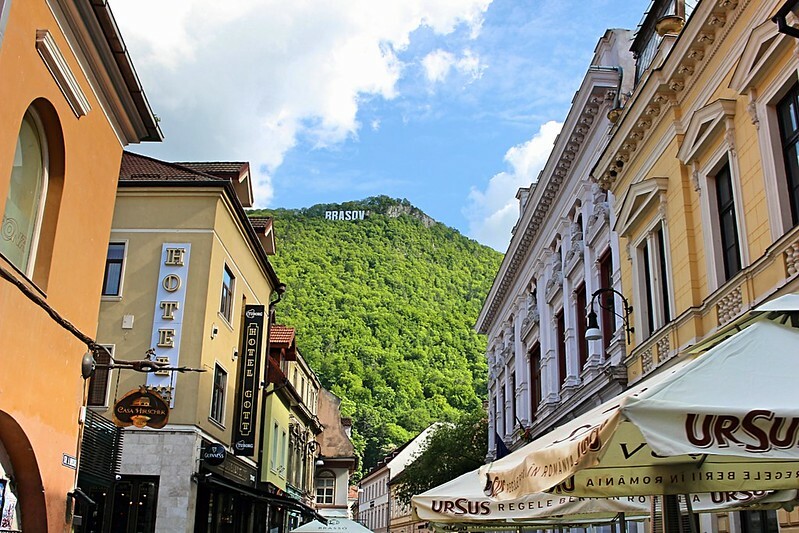 We assumed that Brașov would primarily serve as our transportation hub, but we quickly learned that the city is a gem in its own right, with a well-preserved medieval town square, charming side streets, and tasty twists on traditional food. Brașov’s most iconic site: Casa Sfatului, “Old City Hall,” was built in the 1200s as a watchtower. The Biserica Neagra, “Black Church,” is a rare Lutheran cathedral. It’s also the oldest Gothic church in Romania and has an extensive collection of Turkish rugs. Locals are very proud of their “Hollywood sign.” We stayed in Hotel Gott, on the left. For lunch, we skipped the KFC and tried sour pork soup at La Ceaun, which cooks regional ingredients in cauldrons. Later, we had a great Romanian-French fusion dinner at Casa Hirscher, opened sometime around 1539. Bran is a village with almost as many sheep as tourists. Almost. 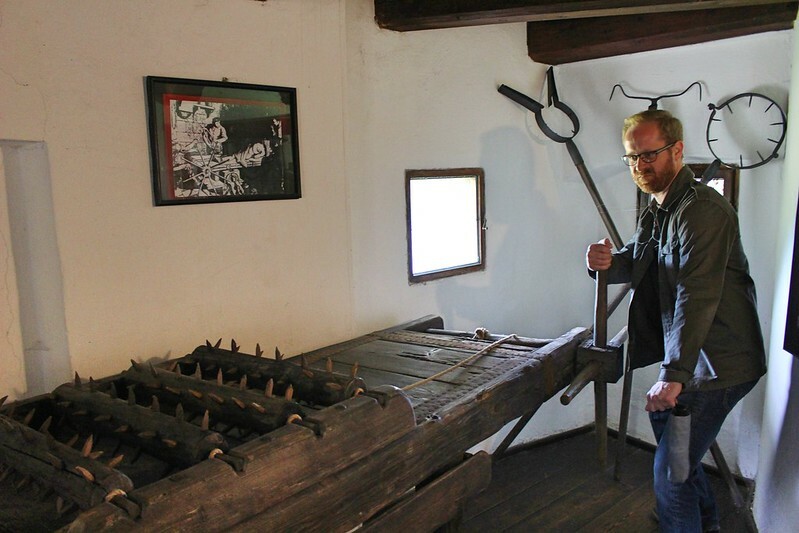 For whatever reason, it’s hip now for travel bloggers to wave off Bran as a tourist trap. But honestly, it’s a fascinating place because of the tourists: an otherwise insignificant castle in a rural valley was saved and restored because an Irish writer (Bram Stoker) who never set foot in Transylvania used it as the setting of his unlikely bestseller about a vampire. And the castle has now become a major economic driver for the entire region. 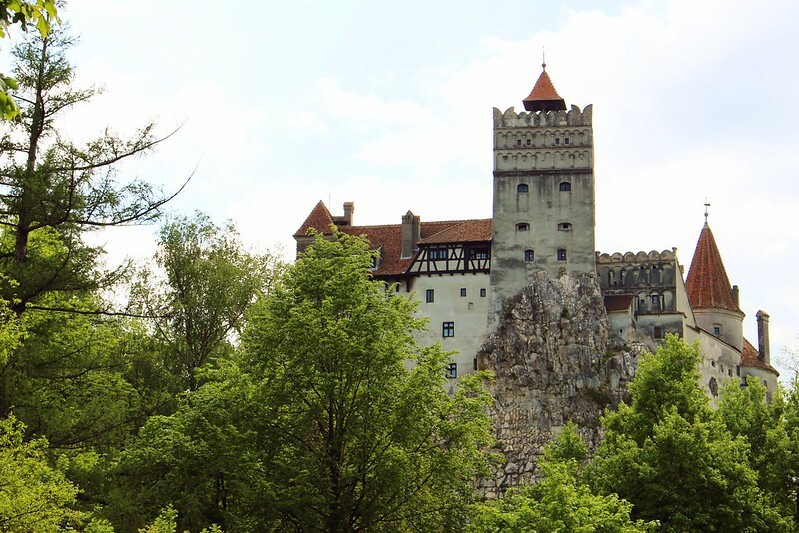 Bran Castle is “Dracula’s Castle,” but it was never the home of the brutal warlord that the Dracula character is based on (Vlad the Impaler). And despite the castle’s best efforts at spooky lighting, it’s not nearly as creepy as the Budapest dungeon where Vlad was imprisioned for 14 years. 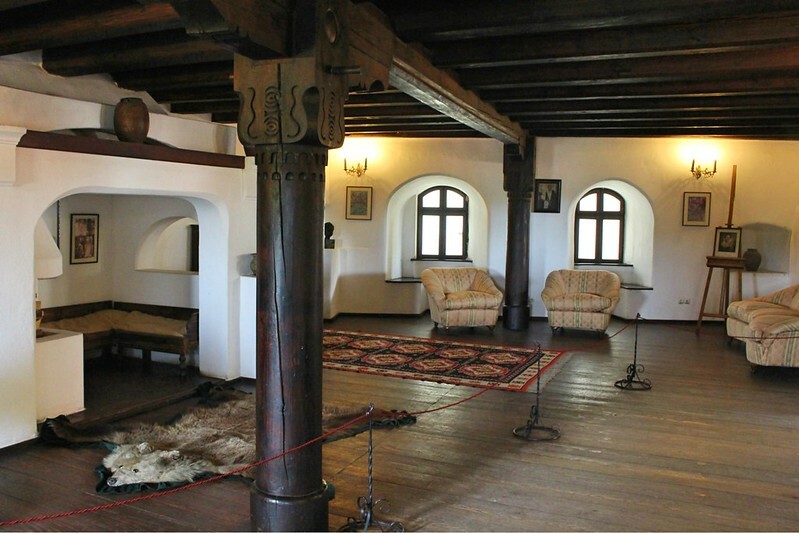 In fact, parts of Bran Castle are downright charming, with intricately painted roof beams and cozy fireplaces. 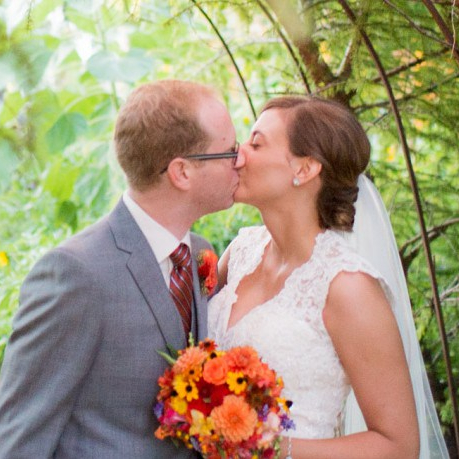 Matt called it “homey,” and that’s really the best word for it. 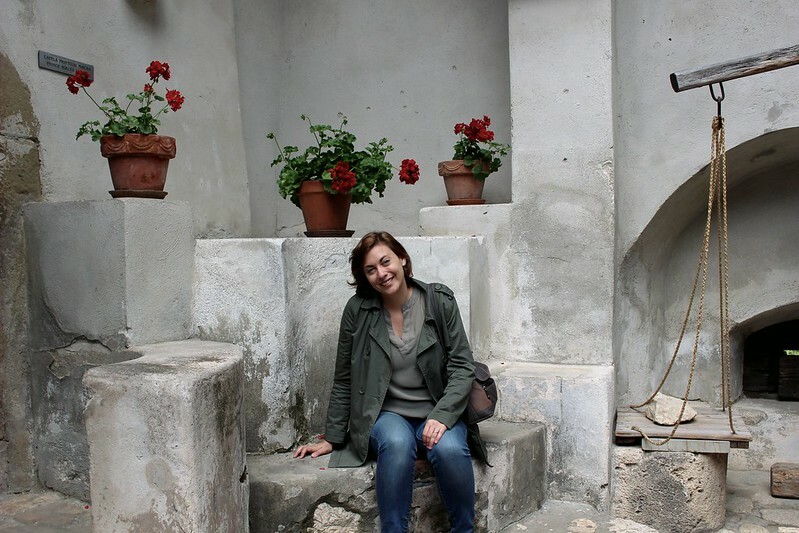 But folks don’t trek all the way to a pleasant village in the Romanian countryside for homey. So the castle also offers a “secret” torture wing with an extensive collection of medieval pain apparatuses, and signs describing Vlad’s violent tendencies far outnumber the halfhearted attempts at educating visitors about the various royals who actually lived in the castle over the years (ironically to us, it’s now owned and maintained by an Austrian aristocrat of Habsburg descent who lives in New York). 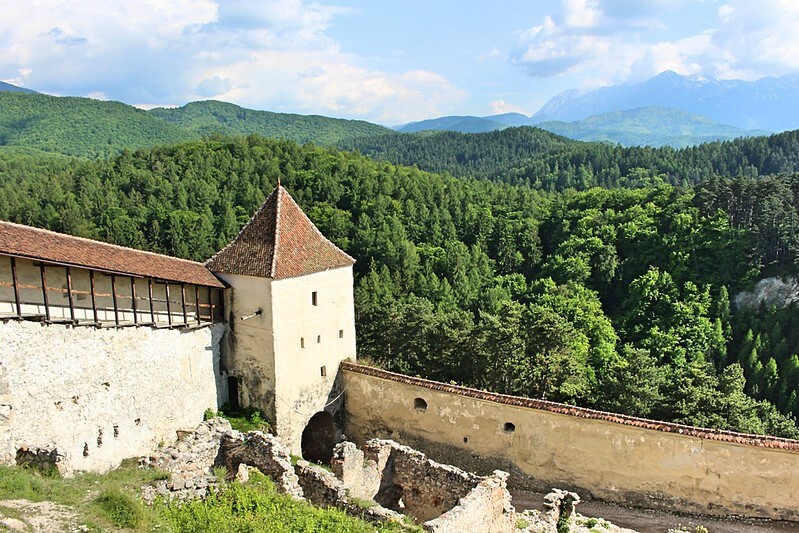 Bran Castle is, if nothing else, a major success story in one of Europe’s least-visited countries. So if you go to Romania, go to Bran. Go to other towns, too, but go to Bran. Is that a Werewolf rug? Matt with “The Rack” in the torture wing. And no, I don’t think he was supposed to touch that. 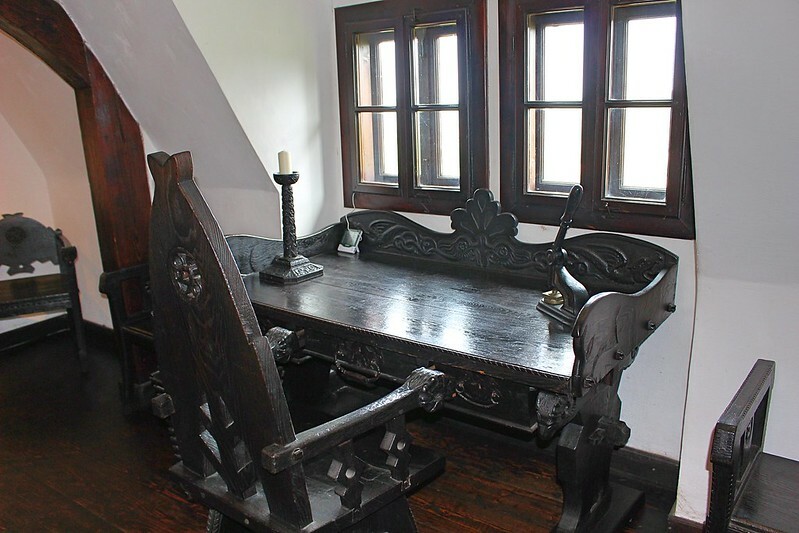 Now THAT’S a writing desk. Sandy in the courtyard, next to the “Witch Scale.” Back in the day, if you weighed less than the townsfolk thought you should, you could be convicted of witchcraft. Hmm. Yes, I bought a copy of Dracula in the castle gift shop, but I also bought some beautiful Horezu bowls at one of the many market stalls set up outside the castle entrance. 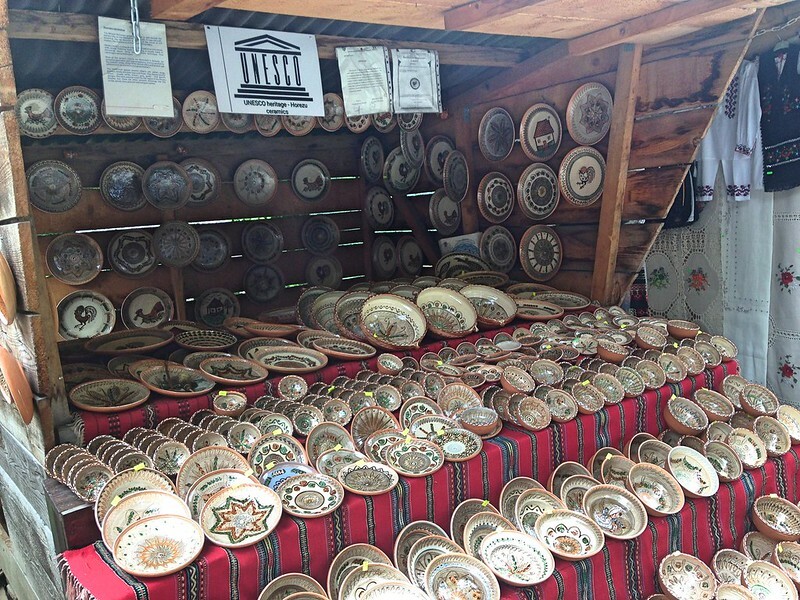 Horezu is a UNESCO-protected ceramics technique used in northern Romania. Watch out for “imposter” Horezus; once you’ve seen the real ones, the knock-offs will be obvious. Romanian buses can be a little smelly. But thankfully ours had a solution. You can’t see it in the photo, but elderly folks in Transylvania often tucks balls of cotton deep into their ear canals to keep out “the current,” an evil wind that can cause illness and headaches. 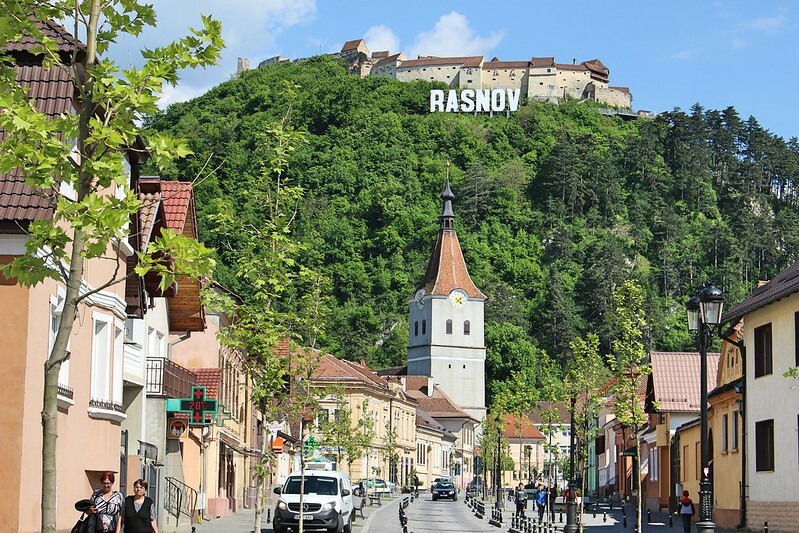 On the way back to Brașov, we hopped off at Râșnov, a small town with a big fortress that dates back to 1211. 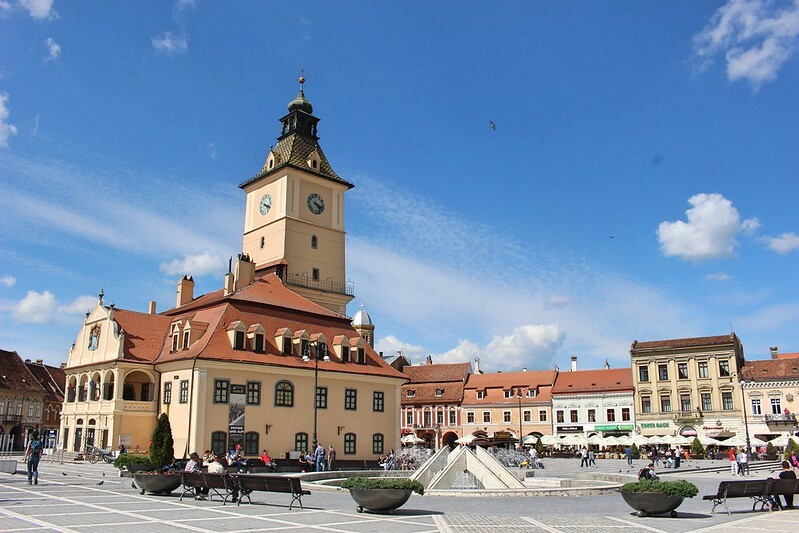 Râșnov town square. They have a Hollywood-style sign, too! 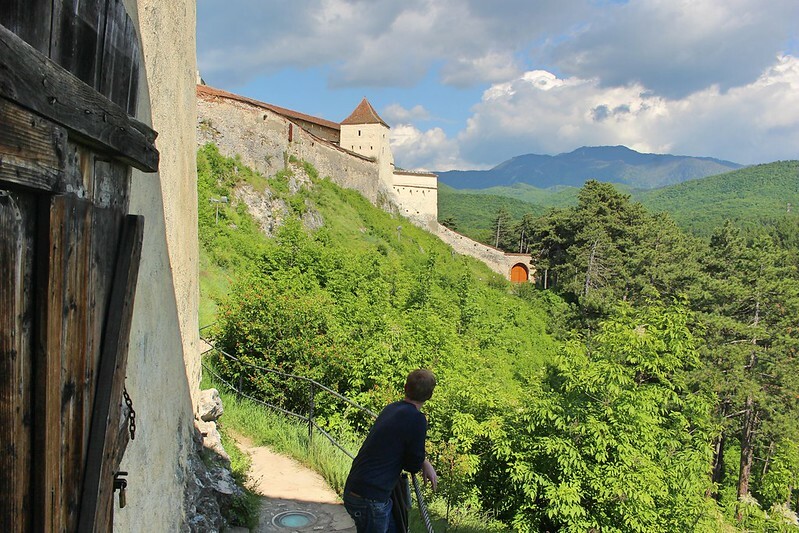 The fortress “backyard,” with stunning views of the Carpathian mountains. Of course there’s a market inside the fortress walls. And every kid bought a fidget spinner. Matt really got into the medieval spirit. The next day we hopped on a doomed train to Sinaia, which broke down twenty minutes after leaving Brașov. We sat for … awhile. We learned a lot about the Romanian oil industry from our talkative neighbor, though, whose young son shyly practiced his English with Matt. We were surprised to hear the the boy speak with a flawless American accent, which his mother credited to watching Youtube cartoons. Our view from the train for about an hour. Eventually, we got a new engine and made it to Sinaia, a town that winds its way upward to several fancy mountain resorts. We then waited out a rainstorm at a hookah bar bar/cafe and hustled up the hill to the thing that everyone comes to Sinaia to see. 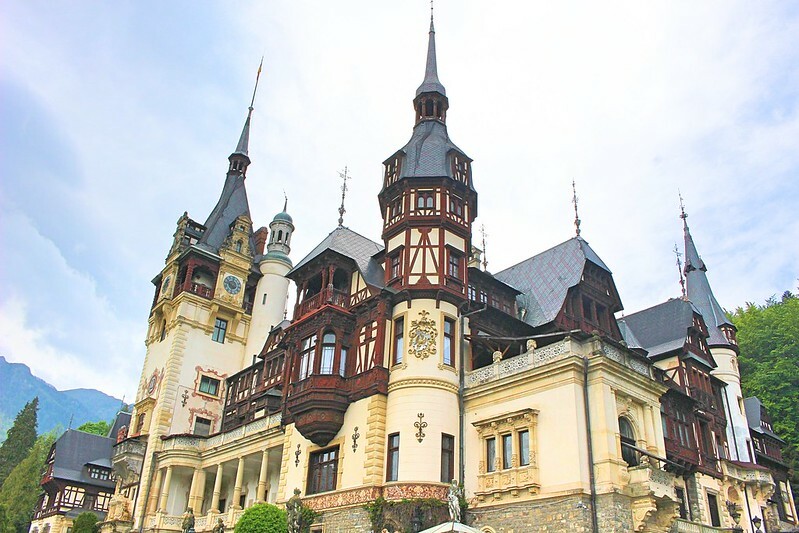 Peleș Castle. It only dates to 1873, but it’s a major tourist attraction for Romanians. The line to get inside was MUCH longer than the line for Bran Castle, and we didn’t have enough time thanks to the train and rain delays. It really is a pretty spot, even if you can’t get in. And yep, there’s a market. This one’s in the woods. 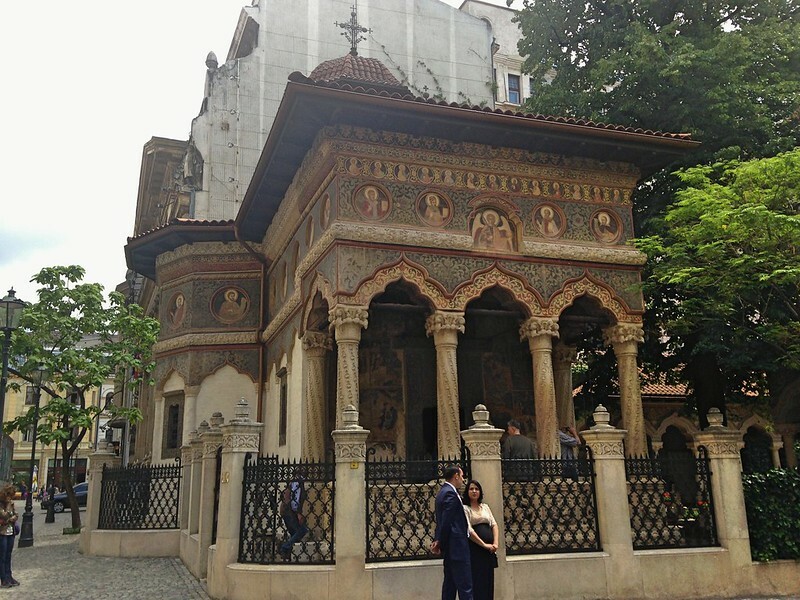 Our time in Bucharest was short by design, but we did have a few hours to explore the city’s Old Town, the Romanian equivalent to Amsterdam’s Red Light District or Dublin’s Temple Bar. It’s popular for bachelor parties, and we walked past several packs of young men squinting painfully in the early afternoon sun. The hungover mingled with the pious since Old Town is also home to some of Bucharest’s oldest churches, all of which were hosting weddings on the Sunday we were there. 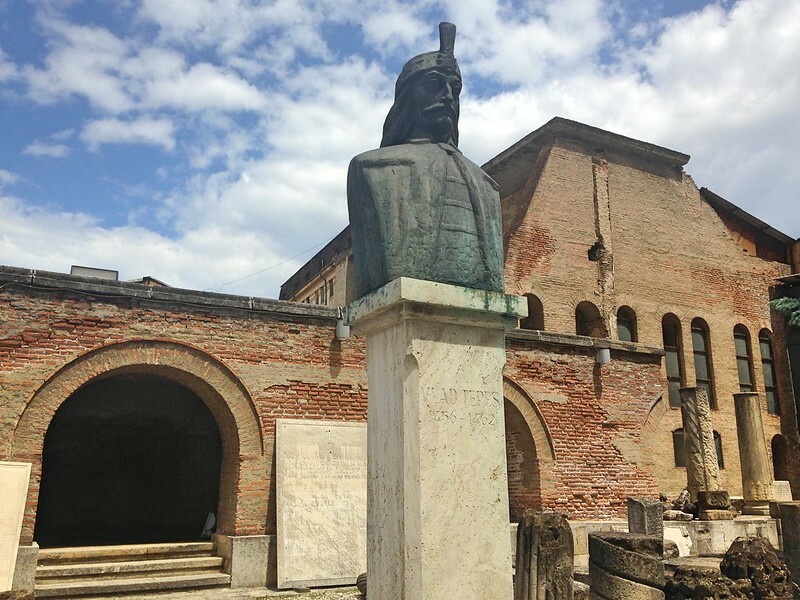 The Vlad the Impaler statue in Old Town, Bucharest. He never lived at Bran Castle, but he did live in that pile of red bricks for about six years. 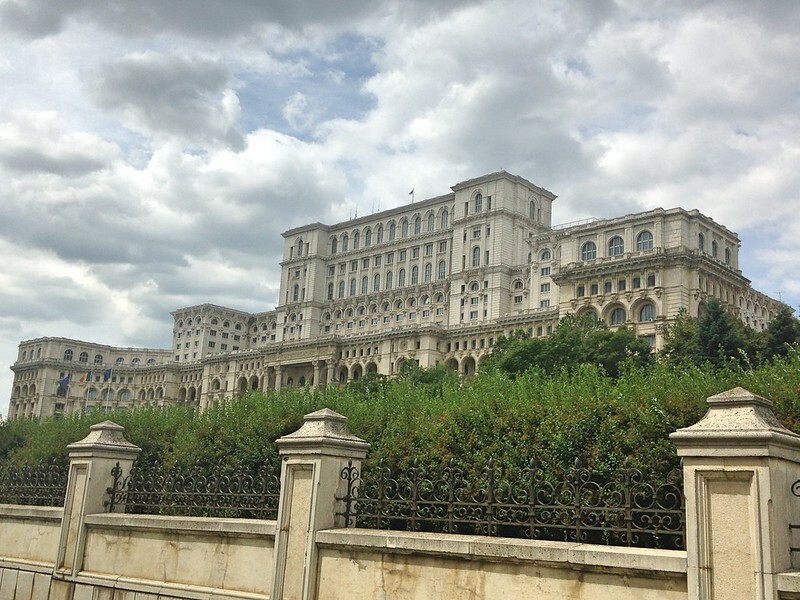 The Romanian Parliament Building is the second-heaviest government building in the world. The heaviest? The U.S. Pentagon. Now you know. Texas did too. Cowboys and food trucks!! 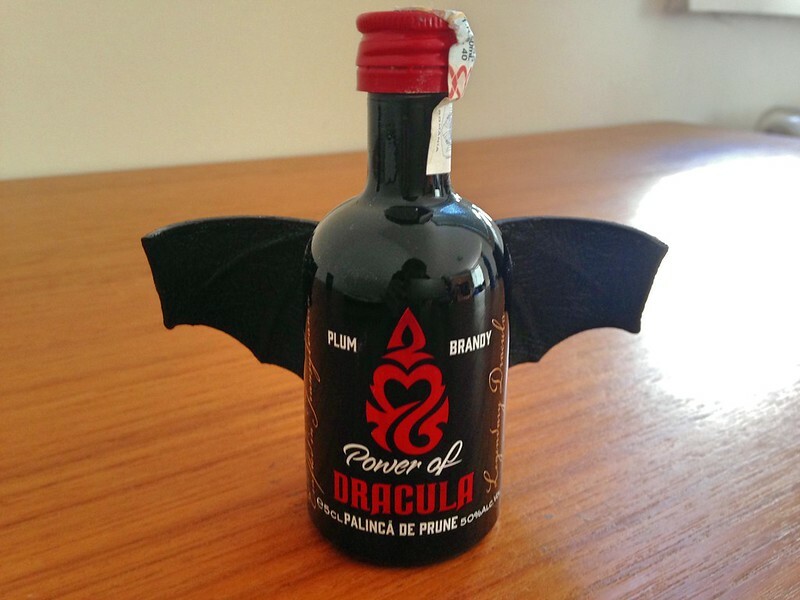 At the airport, I couldn’t resist buying a very overpriced bottle of plum spirits, a Romanian speciality. But this one had wings! Honestly, we were sad to leave Romania, and we know we barely scratched the surface of the sites the country has to offer. 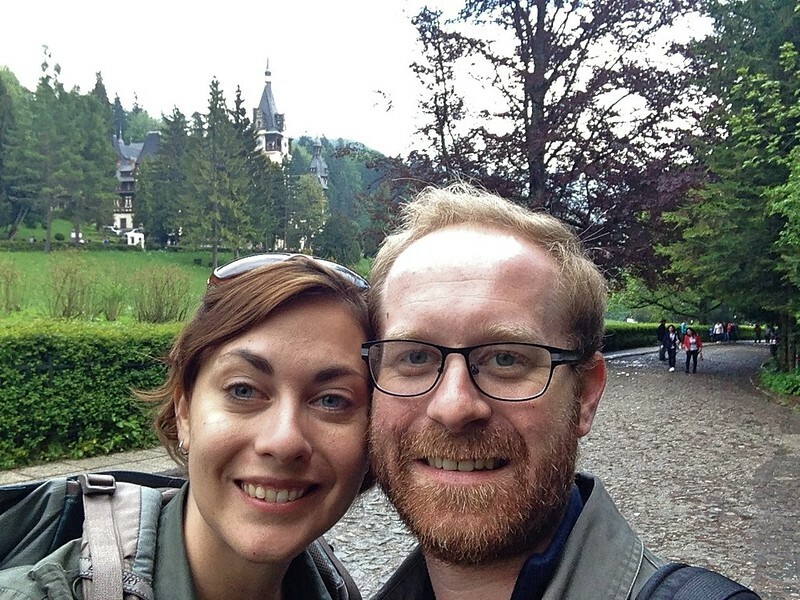 I would highly encourage you to add a visit to Transylvania to your European itinerary. 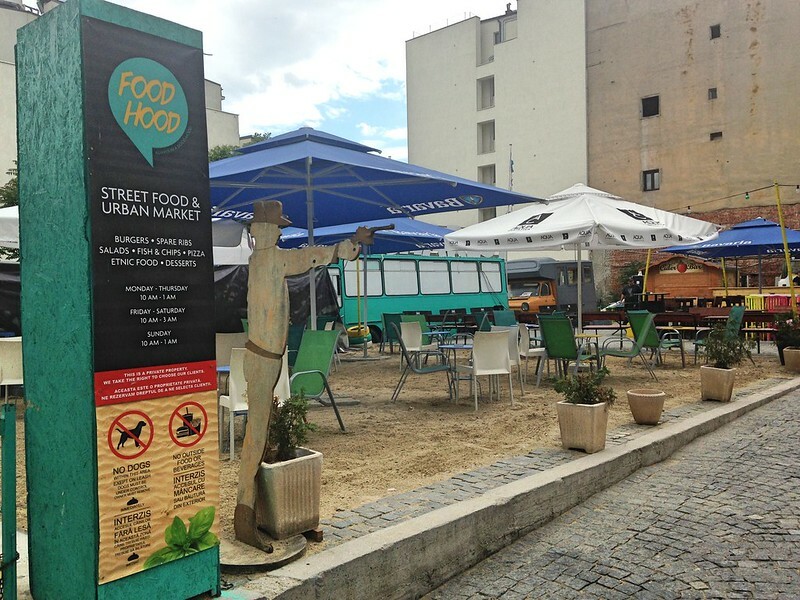 Your money goes a long way in Romania, in more ways than one. This time I’m adding some tips about our travel logistics, because Romanian transportation systems can be somewhat tricky (things work more like Mexico than Germany, if that helps). If you go, I strongly recommend downloading the Romania map from HereWeGo before your trip so that that you can use it offline. It helped us tremendously at every stage of our trip. Anyway, hope this is useful for someone out there on the Internet! Have a great trip! The cheapest and most straightforward option is to take the bus. At the Bucharest airport, follow the signs to the bus pick-up zone. When you exit the airport, look immediately to your right. At the end of the sidewalk is a small RATB kiosk where you can buy bus tickets. To get to Gara De Nord (the train station), look for the 780 bus. It will take about 45 minutes to get from the airport to the train station, and each ticket costs 8 lei. *If the ATM only gives you 100 lei notes, be sure to break one at the Express market inside the airport. The RATB kiosk will not accept large bills. You cannot buy tickets on board the bus. From Gara De Nord to the airport: Another RATB kiosk is located in front of the train station. Buy your return ticket there. The bus stop itself is behind the train station, and it’s pretty sketchy. Check the timetable at the stop so that you know exactly which bus you’ll want to catch. You won’t want to spend more time at the stop than necessary. If you have some time to kill in Bucharest, take metro line 2 (the subway) to Piata Unirii and you’ll be within easy walking distance of Old Town and the parliament building. From Gara De Nord, you’ll have to get on metro line 1 and change to line 2 at Piata Victoriei. Tickets are sold at the kiosks right next to the turnstiles. Gara De Nord is not known for its signage. Inside the station, as you’re facing the train tracks, keep to the left and look for the CFR ticket window on your left (calatorie is the word for ticket). They’ll have a timetable on the window, and you can pick your train to Brasov. 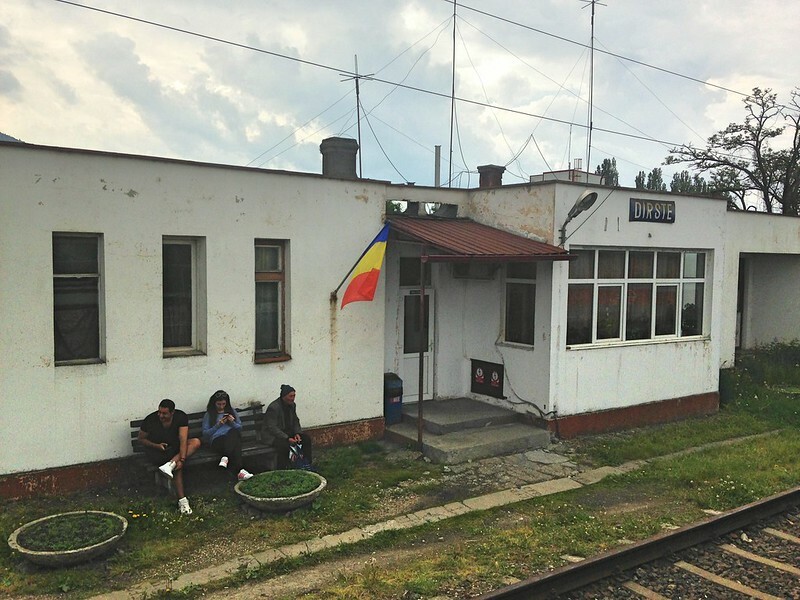 The train from Bucharest to Brasov will take about 3.5 hours. The trains are not especially clean and there are no food or drink carts on board. I highly recommend picking a hotel in Old City. (We stayed at the Hotel Gott and loved it.) It may be tempting to pick a hotel closer to the train station, but Old City is much more comfortable and interesting for tourists. In front of the train station, you’ll see the city buses and a kiosk selling drinks and snacks. Around the back of that kiosk is where you will buy your bus tickets. (You can’t buy tickets on board.) One ticket includes two trips and costs less than 5 lei. Bus 4 will take you to Livada Postei, the bus hub within a few minutes walk to City Hall Square, the “center of the center” as a taxi driver called it. *The bus does not tell you the stop names; it’s on you to know where you’re going. Ask your hotel to call a cab for you to Autogara 2. 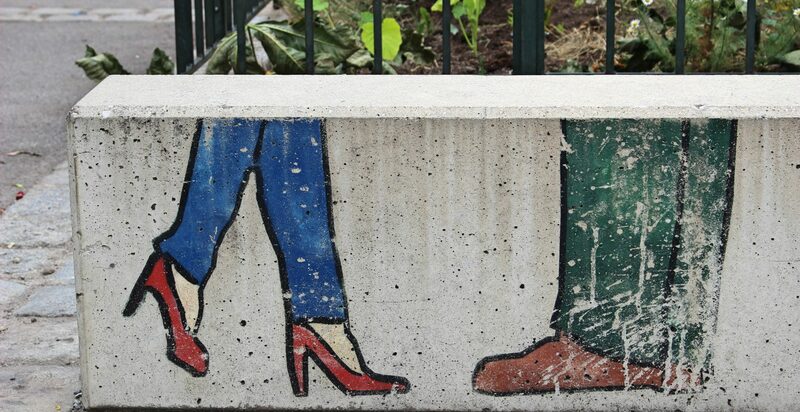 (From Old Town, it’s not walkable.) Most of the buses will say Transbus Codreanu on the side. Watch for the one with a sign for Bran in the window; it will pull into the second stall on the left side of the median when you’re facing the station building. Each ticket will cost about 7 lei, and the trip takes about a half hour. You have to buy your ticket from the driver. 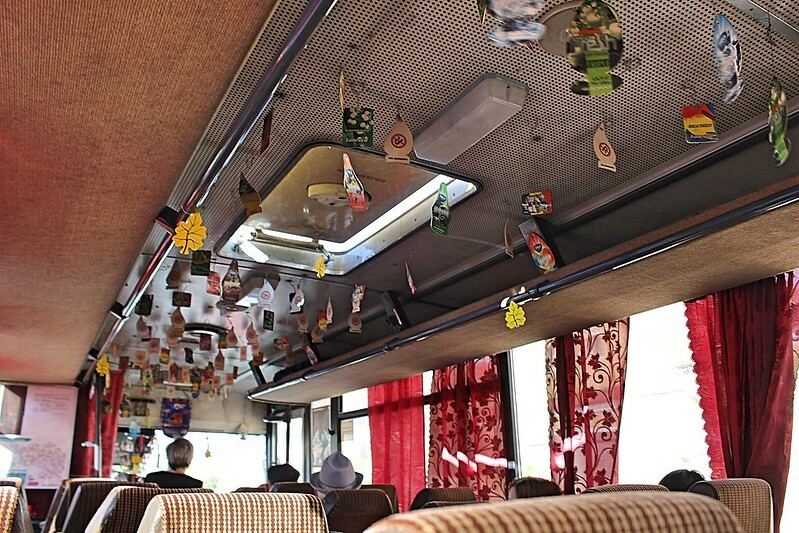 The Bran buses run from Brasov on the hour, every hour, and there are intermittent ones between those, as well. 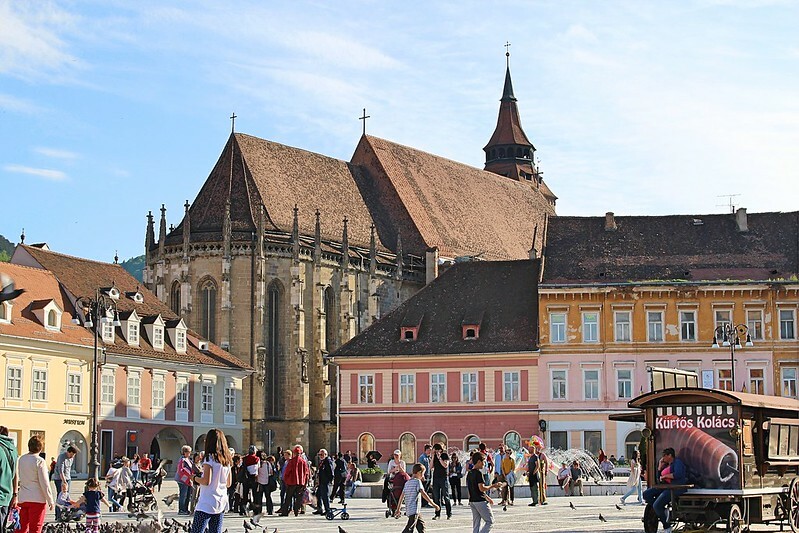 Every tourist in Brasov has been told to aim for an on-the-hour bus, so be there at least 20 minutes in advance to make sure you can get a seat. Our bus was full 10 minutes before departure. The bus will take you very close to the castle, and just follow the crowd through the market stalls toward the ticket office. The bus back to Brasov picks up right across the street from where you were dropped off. Don’t be afraid to take a cab from Autogara 2 back to your hotel — just watch to make sure the meter is running. Early is the key word here. By afternoon, the ticket line is long and the narrow corridors inside the castle are packed. Be sure to ask the ticket agent for the torture room add on. For only two dollars more, you’ll get to see the castle’s robust collection of torture tools, and you’ll also get a breather from the crowd. (There’s no information about the torture room on the ticket window sign, so most folks don’t know to buy the add on.) The entrance to the torture wing will be obvious as you wind your way through the castle. Watch for an employee guarding a rope gate on the second floor. Flash your torture ticket and the employee will let you in. Bran Castle takes about two hours, three at the absolute most. There’s a public restroom at the actual castle; waitresses at the cafe next to the entrance to the castle grounds are snippy about non-customers using theirs, so don’t get suckered into paying (and waiting) for a cup of coffee you don’t want. In general, service folks in Transylvania are exceptionally kind to tourists, and they will help you if you are lost or confused. 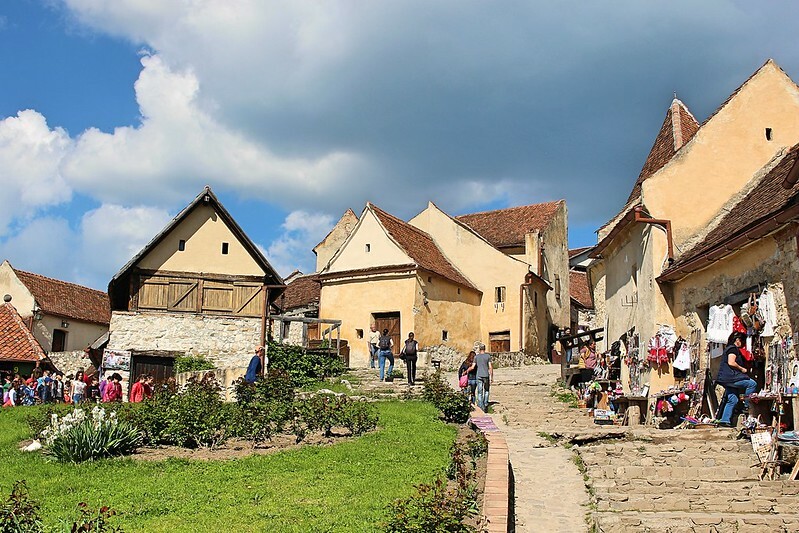 There are well-established routes from Brasov to the major attractions in Transylvania, and if a local senses that you’re off-course, they’ll nudge you in the right direction. So don’t panic, and just try to go with the flow. English is prevalent among younger people, especially in Brasov and Bran. Older generations learned Russian in school, but taxi drivers and other service folks will do their best to hang in there with you. Keep it simple, and you’ll be just fine as a monolingual. Standard tipping in restaurants is 10 percent, but it doesn’t hurt to be generous. 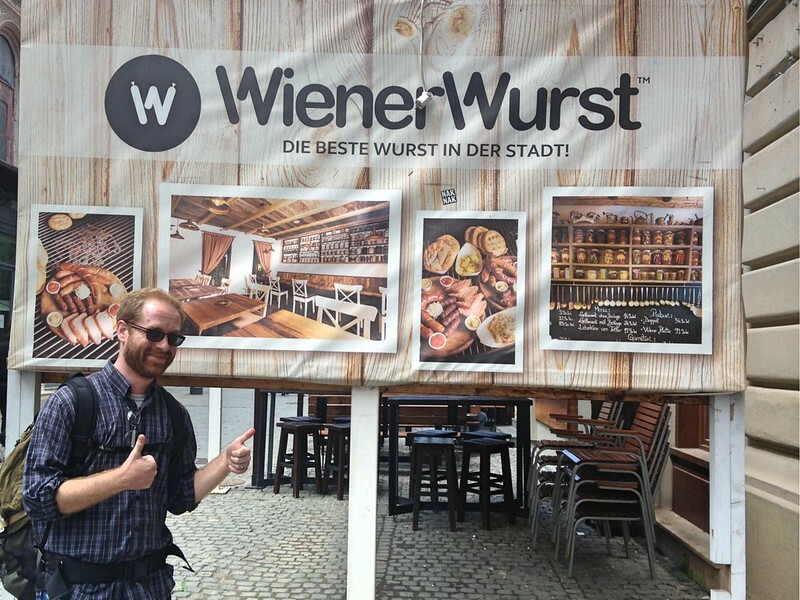 There are a ton of Americans in Transylvania, and we have a high tipping reputation to uphold! Yes, Roma people will approach you for money, cigarettes, and other things. Don’t let kids get too close to your pockets and use common sense. 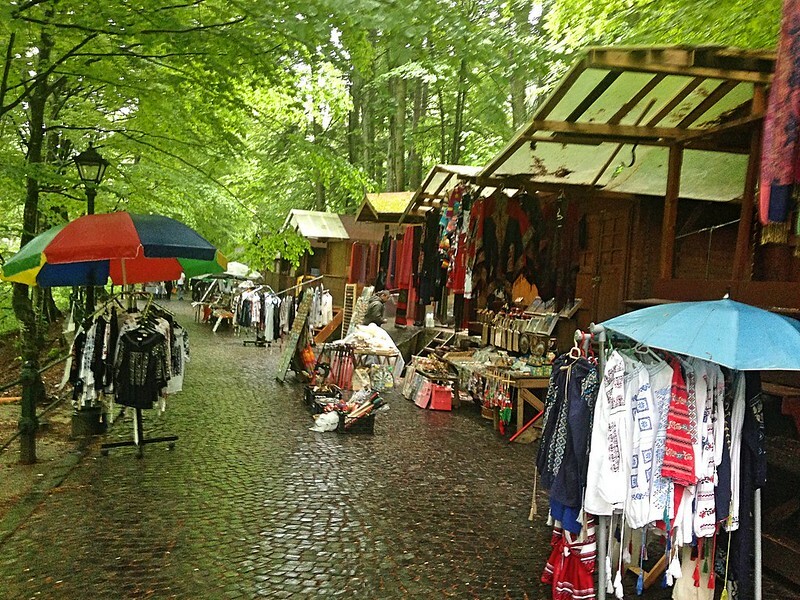 Don’t be afraid of the market stalls outside major attractions like Bran Castle and Peles Castle. There’s a lot of kitschy crap, but keep your eyes open for some really great Horezu ceramics and lacework. And finally, build extra time into your itineraries. Because sometimes, train engines really do break down. What awesome pictures and trivia facts! They both gave me a glimpse of Romania. There are many big sites on which to comment, like the castles, the parliament building, the quaint old towns and the vistas. But there are two small things that stood out to me. 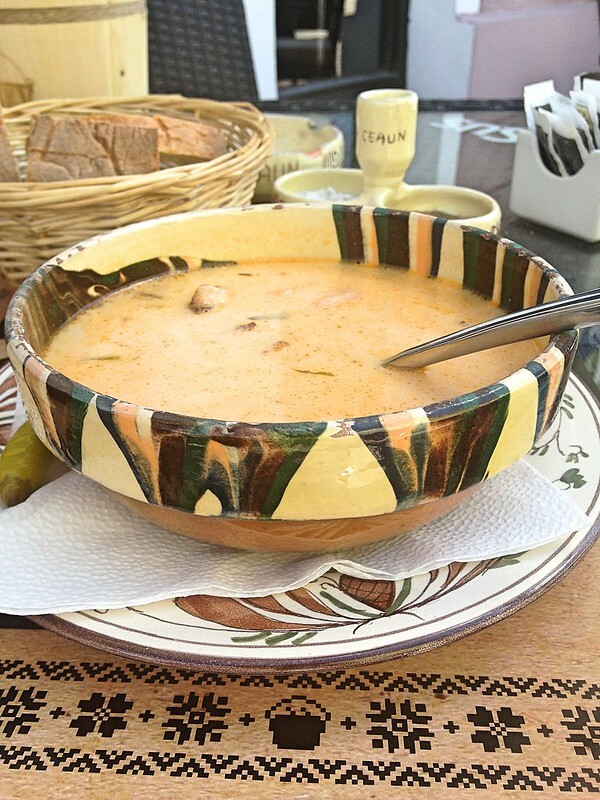 The first was the “Hollywood signs” in both quaint towns of Brasov and Rosnov and the second was the beautiful pottery in which your pork soup was served. I am not sure that was the Horezu pottery that you show later in your pictures or something else, but I noticed it right away in that picture. I enjoyed watching Matt in action with the ax throwing. And I am glad that Matt took a picture of you, Sandy, along with the selfie of the two of you. What an amazing place! I would absolutely love to visit one day! You added some very useful tips and insight espcially for first time travelers. And yes, Bran may be a little kitsch and it’s not part of the Dracula legend as much as it wants to be, but it’s still a nice experience.